Size: Small (4-6X), Color: Green is currently out of stock! This is an officially licensed Tinkerbell product. Get a delightful and bubbly look with green Tinkerbell costume. Girls always want a charming and sprightly themed costume for parties so Tinkerbell attire fits perfectly in this purpose. Leave your worries behind while soaring in the sky with mesmerizing Tinkerbell. Babies bring lots of fun and happiness in our lives. So they have earned a right to look special. Babies got high fashion sense too. So you can't just pick up any outfit for them. 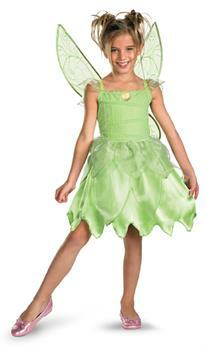 Dress up like an iconic legend in our Tink and the Fairy Rescue - Tinkerbell Classic Toddler / Child costume.